Dr Annuar (front left) performs the Ngajat Meling Ranyai at Rumah Agnes. SIBU: The Sarawak government has approved RM2.235 million for repairs and upgrading work for 149 doors of the 34 longhouses in Nangka constituency. Assistant Minister of Housing and Public Health Dr Annuar Rapaee said RM15,000 has been allocated to each door. “The funds were approved last year, and repair and upgrading works are already in progress. 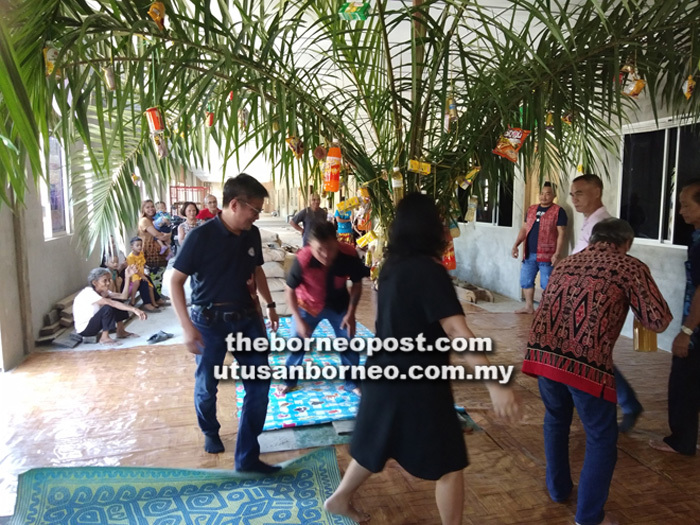 The works are expected to reach completion by the end of this month,” he told thesundaypost after paying Gawai visits to five longhouses yesterday. The longhouses were Rumah Manjah, Rumah Agnes, Rumah Jok, Rumah Melissa, and Rumah Sebastian. He also handed out minor rural project grants to the longhouses. Dr Annuar called on the longhouses in the constituency to set up women’s and youth bureaus. “It is to enable them to have their own programmes and engage the youth in healthy activities,” he said. The Nangka assemblyman said it is also necessary to have a database of the single mothers, orphans, elderly, and persons with disabilities from the longhouses. “In that way, assistance can be channelled to these people,” he said.